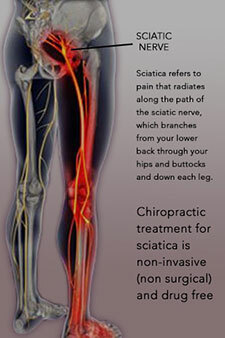 Sciatica is referred to as any pain that is caused by the sciatic nerve. The sciatic nerve is the largest and longest nerve in the body. It begins as branches of the 4th and 5th lumbar nerve along with the 1st, 2nd and 3rd sacral nerves which merges to form the sciatic nerve. The nerve then runs inferiorly through the gluteal region and down the posterior thigh to a point just above the knee when it branches into the tibial and common peroneal nerves. These nerves continue downward to the lower leg, ankle and foot and delivering nerve signals to the skins and muscles of these regions. When experiencing sciatica, one must first correctly identify where the nerve is experiencing pressure or being compromised. This can occur at the spine itself, in the lower back, hip region, gluteal or piriformis muscles in the buttock region or elsewhere within the thigh, lower leg, ankle and foot. Once the cause of the sciatica is diagnosed then a treatment plan specific to the cause of the sciatica can be formulated. This can include chiropractic adjustment, soft tissue therapy, lumbar traction or decompression of the lumbar spine and electrical muscle stimulation. Chiropractic care is a safe and drug free proven treatment of sciatica that can resolve the problem and allow you to return to pain free activities of everyday life.